Here it is! I've been holding off showing what the card faces will look like in the Dungeoneer RPG. The main reason being they were not finished yet. Well, this is still a work in progress, there is much more finessing to be done - but it gives a clear indication of the improvements in the design, legibility, and most importantly playability of the new card faces. I will refrain from describing the new features because I want to hear what you think first. I have neglected posting here far too long. Things have been moving slowly and I even had to set aside working on the Dungeoneer RPG for a time to regather my thoughts. The goal has been to create an RPG that can be played out of the box, with minimum set-up time, and accommodate an evening quick play or an extended campaign. Which by campaign I mean a game where the players take their heroes from lowly adventurers to legendary heroes over the span of about 3 game sessions each lasting 4-8 hours. One of the biggest challenges has been the character sheets. Our editor wanted large full-color sheets, lavishly illustrated, easy to read and dynamic. I have posted earlier attempts that had various levels of success. This is the latest, and best I think. It has really been streamlined! Now all stats are tracked on one bar for instead read - no searching around to find the stat you are looking for. I really liked the earlier sheets that were in "landscape" orientation, because it maximized the play area for where the cards go. But I didn't like how the information on the sheet looked. In this "portrait" version I looks dramatic as well as being well organized. Form and function as they say. I'll be curious to here your reaction. Until then, happy Dungeoneering! Here is a little write up on a classic Boss monster. They say evil is in the blood, and that would certainly seem true with Ramalith. The great grandson of the legendary wizard, Zum, Ramalith was born to be a great wielder of magic. However he struggled with his apprenticeship, and could barely grasp the basic concepts of even the simplest spells. Until one day, in an alchemy lab he saw a pogling (a baby pogwai) being dissected for its components. He was fascinated at how each component could be used for various effects. The bubbling beakers of magical liquids captivated him and he knew he’d found his calling. Ramalith became obsessed with learning every aspect of alchemy, and it wasn’t long before the piles of dead animals began to fill his study. The other students complained of the horrid stench, and the mage-teachers warned him, but he pressed on. Until one day a student was missing. There was never any proof that Ramalith had anything to do with the missing student, but all fingers pointed at him. The situation became intolerable and finally he was expelled. Ramalith left the school, bitter and dejected. He vowed to show them how great he truly was. Ramilith opened an apothecary shop on the fringes of Palanthion, and earned a reputation for having the most effective potions. As his reputation grew, rumors started appearing that he used the blood of people in his formulas. Then a rash of children started disappearing, and strange, foul beasts were spotted in the surrounding countryside. Again Ramilith found himself the center of accusations. He was banished, and run out of town. Traveling to the very edge of the Dunwin wastes, Ramalith found an abandoned fortress. He built an impenetrable vault in the dungeon under the ruins, and once again resumed his experiments. Even more hideous creatures have begun to appear in the scarcely populated towns nearby. Devouring crops and livestock, they have been increasing in strength and numbers. The call has gone out for bold adventurers to seek out Ramalith, and stop his evil work. 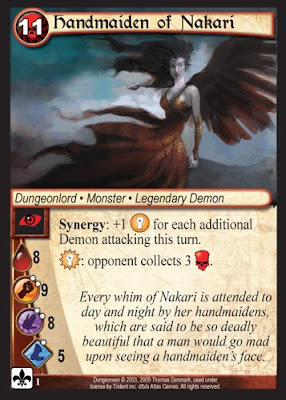 Fiends cost 1 less Peril while Ramalith is attacking or in a Pack. Fiends have +1 to all attacks while Ramalith is attacking or in a Pack. First I must apologize for the time between posts. Even though things have been quiet here work does continue on the Dungeoneer RPG. The Hero sheet has been refined, and while the changes may seem minor, they are important and reflect the level of polish we are putting into this deluxe box set. On a final note, I have been getting a LOT of emails about Dungeoneer Scenarios. I want to assure everyone that it is still in development. And while it has taken a back seat to the Dungeoneer RPG, I do continue writing every week on it. I was hoping to have it done in time for Gen Con, which I will be at, but that is looking like an impossibility. Until next time, Happy Dungeoneering! Here is a revised version of the character sheets. After much feedback we've adjusted some of the positioning. Below you can see it in action with tokens that indicate your latest peril, glory, melee, magic, speed, and life scores. Yet to be revealed are the calling and culture cards, which is how you customize your base Hero! Sorry for the lack of posts lately. We have been working hard on the Dungeoneer RPG! As a just reward for your patience I present a work in progress Hero sheet for your review. This is where you can track your character's progress from lowly novice to Legendary Hero! We are trying hard to eliminate the need for a pencil and scrap paper. The number slots are for tokens that are provided to track your current Melee, Magic, Speed, Life, Peril, and Glory scores. The rest of your character is tracked with cards, such as Treasures, Skills, and Spells. The card slots you see are for character creation. You select a Calling (kinda-sorta like "alignment" in classic fantasy RPG's), a Culture (kinda-sorta like "race") and baked into the sheet will be the Heroic level card represented by the Hero sheet. 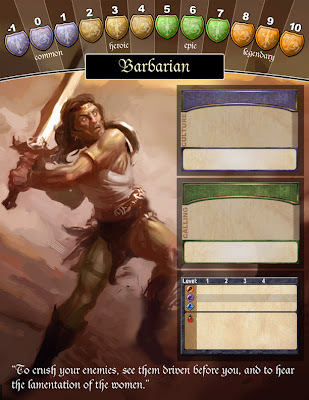 This hero card is printed on the right edge so that just like in the Dungeoneer card game you can slide the Epic and Legendary level cards underneath to reveal your progression by level. For this example I just plopped in the classic Paladin from the original Dungeoneer: Tomb of the Lich Lord set - so you can see just how compatible the RPG is to the card game. But of course we will have unique Heroes and their "race" will not be printed there, since that is determined by the Culture card you choose. Culture determines where you hero was raised and to what race. Such as a woodland gnome or a savage human or an imperial elf. These provide basic stats for your hero which modifies your total stats. Such as +1 Magic for an imperial elf. Calling determines the reason your hero is, well, a Hero. Is he out for Justice? Revenge? Honor? These are just a few of the callings. These give your hero bonuses when performing certain actions in the game, and especially for the types of Quests he chooses to complete. I hope you enjoyed this sneak peek. I'll try to post more frequently - the time is getting short when this goes to press!